A Doctor of Physical Therapy is trained to evaluate and treat a variety of conditions ranging anywhere from chronic lower back pain to stroke. But why see a physical therapist before another provider? According to a study of 150,000 insurance claims, patients with low-back pain are actually better off seeing a physical therapist first in regards to alleviating their pain. The study, published in Health Services Research, found that those who saw a physical therapist at the first point of care had an 89 percent lower probability of receiving an opioid prescription (therefore avoiding the risk of addiction), a 28 percent lower probability of having advanced imaging services performed (saving the patient money), and a 15 percent lower probability of an emergency department visit. It did, however, show a 19 percent higher probability of hospitalization- but why is this a good thing? This higher rate of hospitalization indicates proper referrals by PTs to specialized care when pain does not resolve by addressing potential musculoskeletal causes first and, instead, may indicate a more serious issue such as an underlying systemic condition-heart condition, renal failure, cancer etc. Not only can physical therapy make you feel better, but it can reduce the cost of unnecessary imaging, reduce potential dependence on pain medication and “catch” potential underlying conditions early leading to better treatment options and outcomes for such conditions. Why seek care from a Doctor of Physical Therapy versus a traditional Physical Therapist? The ability to recognize and properly refer patients who present with conditions that do not appear to be musculoskeletal in nature is one reason why seeing a Doctor of Physical Therapy (DPT), would be advisable versus seeing a traditional Physical Therapist Assistant or Technician. This ability to screen patients for various non-musculoskeletal conditions is one reason why the doctorate level degree was developed in the first place. These DPTs have had additional coursework focused on recognizing yellow and red flags for general medical conditions that may not be treatable with physical therapy. They have also had more education on the nature of such comorbidities leading to a more holistic approach to therapy. Did you know that a physical therapist can specialize in certain injury types and sections of the body? Although 42% of patients know that physical therapy can only be performed by a licensed physical therapist, 37% still believe other health care professionals can also administer physical therapy. What they may also not know is that additionally, many Doctor’s of Physical Therapy choose to pursue board certification by the American Board of Physical Therapy Specialties (ABPTS) in specific areas such as neurology, orthopedics, sports, pediatrics, geriatrics, electrophysiology, cardiovascular & pulmonary and/or women’s health. This means that if you are seeking treatment from a DPT with these credentials, you have the opportunity to obtain more specialized care. In order to become specialized PTs must: 1) have current licensure to practice physical therapy in the United States, Puerto Rico, or the Virgin Islands; and 2) have at least 2,000 hours of direct patient care in the specialty area (25% of which must have occurred within the last 3 years). Additional specific requirements are required by each specialty area. PTs must pass the specialist certification examination and be recognized by the American Board of Physical Therapy Specialties to use the above designations. What is the difference between a Doctor of Physical Therapy and Physical Therapy Assistant or Physical Therapy Technician? Physical Therapist (PT): Physical therapists are licensed professionals who have completed an accredited physical therapist program (degrees have evolved from 4-year bachelor degrees to 7-year clinical doctoral degrees) and have passed a licensure examination. Physical Therapist Assistants (PTA): are educated at the associate degree level. Depending on state law, they may be licensed, certified, registered, or unregulated depending on the state. PTAs may only provide physical therapy services under the direction and supervision of a physical therapist (PT). They may not perform evaluations, re-evaluations, discharges or alter the plan of care. They may only execute the plan of care established by the PT. Physical Therapy Technician: have no regulatory designator. Physical therapy aides and technicians are on-the-job-trained workers in the physical therapy clinic who assist the PT/PTA with tasks related to physical therapy services. They are not eligible for license, certification, or registration. The Selective Functional Movement Assessment (SFMA) is a comprehensive assessment used to classify movement patterns and direct manual therapy and therapeutic exercise interventions. Regional interdependence is the concept that seemingly unrelated impairments in a remote anatomical region may contribute to, or be associated with, the patient’s primary complaint. Often times, patients present with symptoms in certain locations, however, this particular area is not the cause of the symptoms. The SFMA utilizes a movement-based strategy in order to determine any movement pattern dysfunctions that may be contributing to any particular symptoms. There are numerous studies that have linked dysfunction in one area of the body with pain and dysfunction in another area of the body. The most common of these examples include hip impairments that are related to low back pain and thoracic spine impairments related to neck pain. In short, regional interdependence provides the theoretical support to assess and treat a non-affected body part. Rehabilitation professionals are the most highly trained healthcare professionals to function within this model. The SFMA consists of 10 defined functional movement patterns that are considered top tier patterns. Shoulder a patient report pain during any of these movements, or exhibit “dysfunctional” movements as defined per certain criteria, the patient pattern will be broken into its individual parts, known as pattern breakouts. Utilizing these pattern breakouts, the rehabilitation professional is able to define impairments as either lack of mobility via Tissue Extensibility Dysfunction (TED), Joint Mobility Dysfunction (JMD), or Stability &/or Motor Control Dysfunction (SMCD). Utilizing this information, we can create a therapeutic plan to address all impairments that may be contributing to a patient’s symptoms. Here at Fox Physical Therapy, our Doctor’s of Physical Therapy are SFMA certified. This allows us to conduct the highest quality, evidence-based approach to developing our patient’s plan of care. To schedule an appointment in Miami or Boca Raton, please call us at 305-735-8901 or click here. References: SFMA Selective Functional Movement Assessment, Ver 16 ed. : SFMA, LLC; 2016. Can Blood Flow Restriction Training help improve patient recovery time following an injury? Read our post below as we discuss everything you need to know. Blood Flow Restriction (BFR) Training is a strategy involving the brief and intermittent occlusion of arterial and venous blood flow that occurs with use of a tourniquet placed around the proximal limb of the upper or lower extremity. When performing BFR for resistance training purposes, relatively light loads of around 20-30% of 1 RM allow a person to increase strength without the stress/strain of heavy loads. Resistance training with BFR has also been shown to increase post-exercise muscle protein synthesis and elevate growth hormone levels. It can be used to improve muscle strength, size and functional aerobic capacity in shorter amounts of time with less stress on the body than typical resistance training. Blood flow restriction training (BFRT) essentially tricks the brain-body into thinking one is performing high-intensity exercise when, in fact, the loads are much lower. BFR can also be used to reduce muscle atrophy through passive applications and by creating cellular swelling. Who can benefit from BFR? BFR can be useful for rehabilitation, fitness, performance training or recovery and is ideal for populations who have limitations to high mechanical loads such as those who are bedridden, casted/braced, pre/postoperative and/ or elderly. In addition to these more fragile populations, BFRT can also be used on the athletic community for performance training. How is it used? What does a treatment session with BFR look like? BFR can be used in different ways depending on the goals and limitations of the individual. In all circumstances, the cuff is first applied as proximal on the limb as it can be placed. Next, the loss of pulse (LOP) is calculated using an ultrasound unit to determine at what pressure a person’s pulse in that limb can no longer be detected. Lastly, a pressure in the cuff is set depending on the type of BFR to be performed. In Passive BFR (no exercise) used to reduce muscle atrophy and stimulate capillary growth, the cuff pressure is set to 100% LOP and a patient sits with the cuff on for 5-minute increments with 5 minutes of rest in between. In Cellular Swelling and Strengthening protocols, the cuff pressure is set between 40-50% for the upper extremity and 60-80% for the lower extremity. When strengthening, the intensity should be 15-30% of a person’s 1 rep max, and 4 sets should be performed (30 reps; 15 reps; 15 reps; 15 reps) with 30 seconds of rest between each set. A total of 5-6 exercises should be performed during the treatment session with 60 seconds of rest between each new exercise while the cuff is deflated. If the goal is not strengthening, but cellular swelling, which reduces disuse atrophy and recruits muscle fibers (perhaps someone with ROM or WB restrictions), a person should perform 5 sets of 5 minutes with a 3-minute rest in between. This can be achieved with no exercise or while performing isometrics. These are but a few of the ways BFR can be implemented into a person’s rehabilitation or strength training program. For more information on BFR, contact us today, click here. Eccentric contraction exercises are an important and often overlooked component of strength training. Eccentric strength refers to tension being applied to a muscle as it lengthens. This is also when the muscle’s force-producing capacity is most optimal. Studies show that eccentric exercise results in less oxygen consumption, greater force production, and less energy expenditure than concentric strengthening- or the active shortening of the muscle. The force produced by a concentric contraction is always less than the muscles maximum force. During a voluntary muscle contraction, the speed of the contraction and the ability to exert tension are inversely related. Therefore, the faster a muscle contract concentrically, the lower the tension it is able to generate. An example of concentric strengthening would be a classic bicep curl, whereas the eccentric component would occur as a person lowers the arm into a straightened position (as the bicep muscle lengthens). Eccentric quadricep and gastrocnemius (calf) strength, in particular, are important following knee surgeries such as ACL reconstruction because of their importance in absorbing the weight of your body as they lengthen in order to control your descent- this includes going downstairs, sitting down in a chair or decelerating from a sprint. Without sufficient eccentric control, it would be difficult and, in some cases, unsafe to perform these activities. In regards to running, the primary muscles involved in acceleration and deceleration are quadriceps and gastrocnemius. However, acceleration involves the concentric contraction of these muscles, while deceleration involves the eccentric use of these muscles. Therefore, eccentric strength is important to safely slow down following a sprint or before initiating a rapid change of direction. Research suggests that eccentric strengthening on the non-involved lower extremity is also beneficial for improving both the quadriceps muscle strength and the quadriceps accelerated reaction time in the surgical lower extremity. Though the idea of early post-operative eccentric resistance exercise to the surgical limb has traditionally been contraindicated, due to the potential for injury to the graft, articular cartilage, or surrounding soft tissue structure, recent evidence has shown that the application of early eccentrics to the ACL limb can be used to safely increase quadriceps muscle volume and strength. While eccentric quadriceps strength is important to regain following ACL reconstruction, it does not come without caveats. As with any eccentric training program, careful progression of training volume and intensity in the post ACL reconstruction patient is a necessity and should be performed under the direction of a licensed physical therapist as too much eccentric quadriceps strength could increase the chances of anterior tibial translation if not accompanied by sufficient hamstring strength. Therefore, a comprehensive approach, including both concentric and eccentric training to both the anterior and posterior chains surrounding the knee joint should be considered. Eccentric exercise has the ability to be an effective means to manage many common orthopedic conditions such as tendinopathies, post-op recovery, and muscle strain prevention. This potential is based on muscle/tendon physiology as it relates to performance. Eccentric exercise, or when the muscle is lengthened and an external force exceeds the force produced by the muscle, has been shown to be more effective than traditional concentric strengthening at minimizing muscle atrophy and improving muscle force production. It results in less oxygen consumption, greater force production, and less energy expenditure and should be incorporated into both a preventative strength training program, as well as, an effective post-op rehabilitation protocol. To learn more about our eccentric strengthening program and to schedule a consultation call 305-735-8901 or click here. The Orthopaedic Clinical Specialist (OCS) is a board certification administered by the American Board of Physical Therapy Specialties. This board certification identifies Physical Therapists who have gone above and beyond in their training in order to ‘specialize’ in the realm of orthopedics. In order to achieve the OCS designation, the Physical Therapist must demonstrate the required knowledge in identifying musculoskeletal dysfunction via a board examination. It is important that if you are seeking care for an injury or chronic pain that you seek out a Physical Therapist that has achieved this OCS designation. This demonstrates that the Physical Therapist has taken the time to gain the required skills and experience in the realm of musculoskeletal disorders. This also, more importantly, ensures that you are receiving the best care possible. If you thought you were experiencing an issue with your heart you would likely seek out the help of a Cardiologist, an MD who specializes the cardiovascular system, instead of a general practitioner. The same holds true for your Physical Therapist. If you have an injury to the bones, joints, or associated muscles it is in your best interest to seek out care from a Physical Therapist who is an Orthopaedic Clinical Specialist. At Fox Physical Therapy our mission is to provide the best orthopedic evidence-based musculoskeletal care in South Florida. Our board-certified Doctors of Physical Therapy will quickly identify and resolve your pain without the need for medicine or surgery. We have two locations in Wynwood, Miami, and Boca Raton. Contact us today schedule an appointment. The true source of your back pain—is it really what you think? Do you have back pain and are thinking about getting an MRI? Or maybe you got your MRI and you believe the results spell dread? The relationship between MRI changes and low back pain may not be so clear-cut. In fact, research shows that changes on an MRI don’t necessarily correlate to pain, while many patients with pain show no abnormalities on MRI. Before jumping to any conclusions, read on for more detail on the complex relationship between what your image shows and whether is it ultimately driving the pain and symptoms you are experiencing. First, if you’re experiencing back pain, you are not alone. Pain in the lower back is one of the most common musculoskeletal complaints. In fact, 8 out of 10 people will experience low back pain over their lifetime. About 1 out of 4 people experience chronic low back pain (lasting longer than 3 months). Any structure of the lumbar spine that is innervated by nerve endings can cause both low back pain and/or referred pain, which is felt in one or both lower extremities. Some of the more common potential structures that may be involved include muscles, ligaments, vertebrae, facet joints (joints connecting the vertebrae), dura mater ( a membrane that surrounds and protects the spinal cord), and nerve roots. So how could my imaging be wrong? Imaging is useful in detecting fractures, abnormal tissue growth (i.e. cancer), inflammation/ bleeding, as well as serious compression of the spinal cord or nerves, which can help direct appropriate treatment. However, 99% of people with low back pain will not have any of these serious conditions. A large percentage will, however, have incidental findings on imaging which are normal anatomical variants, as well as normal age-related changes. In these cases, imaging is much less helpful in identifying the true cause and directing treatment. In fact, several studies have found that pain in the lower back is more strongly associated with factors such as life dissatisfaction, neuroticism, hostility, extroversion, and poor sleep quality than it is with findings on imaging. Thus, obtaining an imaging report can sometimes cause more harm than good. Research shows that patients who undergo lumbar MRI generally have worse outcomes than similar patients who do not have to image. Much of this is attributed to psychological factors, misinformation, and negative emotional responses. One common example is the finding of “dark” T2 signals within the disc on MRI. This is most often a pain-free and benign condition. However, it is labeled degenerative disk disease (DDD) leading many patients to believe their spine is “deteriorating.” In turn, these inappropriate beliefs can lead to a decrease in activity, anxiety, lifestyle changes, a perception of increased pain, changes in motor patterns, and unnecessary surgeries. So, what exactly does the evidence say? The exact nature of the relationship between imaging and pain is unclear, largely due to abnormal imaging findings in large numbers of people without pain (false positives). This means that many of the “abnormal” findings are indeed commonly occurring and natural parts of the aging process. One of the more common findings in the lumbar spine is disc degeneration, which is a natural process beginning fairly early on in life. In fact, more than one-third of healthy, normal adults in their 20’s present with degenerative discs on imaging. In some individuals, the rate of degeneration is quicker than others due to a combination of genetic and autoimmune factors, as well as resorption and biomechanical factors. In any case, the volume of intervertebral disc tissue naturally decreases over the lifespan. Changes in diagnostic imaging are seen in many individuals with NO pain or symptoms. Imaging studies (MRI & CT) show herniated disc material in up to 76% of people with NO low back pain or sciatica. One-third of patients without pain have some type of “abnormality” in their lumbar spine (disc degeneration, disc bulge, facet hypertrophy, or nerve root compression). A large percentage of people with pain do not have correlating changes on imaging. Less than half of patients who have pain in the lower back also have an “abnormality” identified in their image—this means that the majority who have pain have no associated anatomical changes. One study involving horseback riders demonstrated an unusually high prevalence of lower back pain, but no conclusive MRI evidence to point to disk degeneration, spondylolysis, spondylolisthesis, or pathologic changes of the paraspinal muscles of the lumbar spine—imaging offered no explanation for their symptoms. In one long-term follow-up study, 80% of athletes and 40% of nonathletes reported pain at baseline. Fifteen years later, 71% of athletes and 75% of non-athletes reported pain. At both points, athletes and non-athletes had similar rates of disc degeneration and the majority of the abnormalities seen on follow-up MRI were already present at baseline. This means that despite very few changes on images, the non-athlete group almost doubled in reports of pain—once again imaging could not identify the cause. Research has shown MRI findings are not related to the intensity of pain or extent of disability, (i.e. larger herniation does not equal more pain). Several studies have found that both vertebral endplate changes and large extruded disc herniation (both believed to be causative factors in low back pain) are equally distributed between healthy subjects and those with disabling back pain. This means that as many patients without pain as those with pain had these changes on MRI and the changes did not correlate with severity of sciatica. Those with both pain and identifiable changes should be cautious, as the changes may not be the direct cause of the pain. As one can see the current research on medical imaging does not support the notion that what is seen on the image correlates strongly with what the patient is experiencing. In fact, it has been shown that a thorough physical examination leading to a mechanical diagnosis can be just a sensitive and specific in identifying the cause of your symptoms. An evaluation by a qualified Doctor of Physical Therapy can help reveal the underlying biomechanical deficits that may have contributed to your condition and prevent it from recurring in the future. Some of the benefits of physical therapy include pain relief, increasing mobility, strengthening of the core and lumbar stabilizers, and increasing balance and functional movement. At Fox Physical Therapy, our board-certified therapists specialize in treating and relieving low back pain. Contact us today to find out how we can help you feel better. Learn how Mechanical Diagnosis and Therapy® (MDT) can effectively treat low back and neck pain. The McKenzie Method of Mechanical Diagnosis and Therapy (MDT) is a unique method of treating spine and extremity pain. The method has been in development for over 60 years, originally created by Robin McKenzie. It is an in-depth assessment, diagnosis, and treatment process that has been well researched throughout the years. Its validity as a treatment method for musculoskeletal pain is consistently supported in the literature. It requires no surgery, medication, needles, or expensive equipment. The research has shown the MDT assessment to be extremely reliable in identifying pain of a mechanical origin. Mechanical pain originates from a biomechanical dysfunction in the way the bones, joints, or associated muscles are moving. The vast majority of musculoskeletal pain, including neck and low back pain, falls into this category. Here at Fox Physical Therapy, we use the MDT assessment as one of our primary methods to effectively treat low back and neck pain. During the assessment, one of our Doctors of Physical Therapy will help to determine the exact cause of your symptoms as well as implement a treatment plan to quickly resolve your symptoms. The best part of the MDT method is that it allows you, the patient, to gain control over your symptoms and keep them under control even when outside of the clinic setting. If you have been experiencing pain or issues with your body and its performance contact us today. You may be experiencing an underlying biomechanical that needs to be addressed by one of our doctors. Don’t let a hamstring strain turn into a recurring injury! Chances are if you play a sport that requires repetitive kicking then you are familiar with the term hamstring strain or “pulling a hamstring”. Hamstring strains account for 12–16% of all injuries in athletes with a re-injury rate reported as high as 22–34%. Hamstring strains are a very common and nagging injury typical seen in athletes who perform high speed sprinting, repetitive kicking and explosive movements associated with acceleration and change of direction. This injury accounts for 38% and 28% of the lower extremity injuries seen in high school and college football respectively and makes up the highest percentage of total injuries in rugby. The high incidence of injury in this muscle group may be partly due to the fact that the hamstrings cross over two joints (the hip and the knee) and are therefore subject to much greater reaction forces at multiple points along the lower extremity chain. The hamstrings are a colloquial term used to describe three distinct muscles, two on the medial side (semimebranosus, semitendinosis) and one on the lateral side (biceps femoris). All three muscles are responsible for bending the knee and extending back the hip, two actions that are crucial for sprinting, jumping, and kicking. These muscles originate from the hip and turn into tendons that with two attaching to the inside of your leg bone and one attaching to the outside, crossing the knee joint. A muscle strain is a term used to describe damage or a tear to the muscle/ tendon. Like most injuries, a strain can range from a simple overstretch injury all the way to a complete tear of the muscle. What most of the literature agrees upon is that hamstring strains are typically caused by a non-contact injury secondary to forceful stretching. Building off this point; when analyzing running technique it has been shown that peak stress on the muscle occurred during a terminal swing phase of the sprint (see image), suggesting that this period may pose the greatest risk for injury. 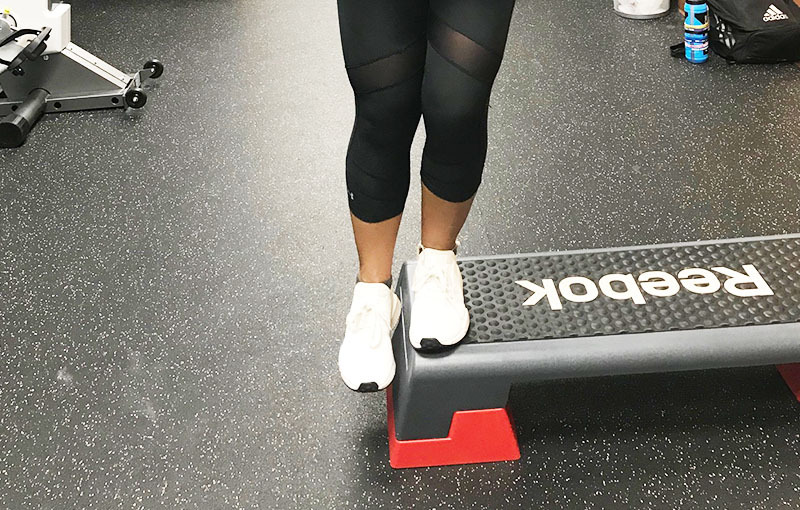 It is during this phase that the hamstrings are working to decelerate the leg while also controlling the degree to which your knee straightens. What this essentially means is that the type of contraction the hamstrings have to perform must switch extremely rapidly from slowing down the leg while it is straightening (the point of peak stress and stretch to the muscle) to then actually driving your hip back to propel you forward. Several research studies support that this rapid change from deceleration to acceleration by the hamstrings is when the muscle is most vulnerable to injury. The severity of muscle strain injuries is generally categorized as Grade I: very mild tear of the muscle with minor strength loss, Grade II: partial tear of the muscle with mild bruising and significant strength loss that limits functional performance, and Grade III: complete tear of the muscle/tendon and severe disability with day to day activities. Complete tears like a grade III are rare, constituting about 1% of all hamstring strains. What is commonly observed with grade I and II strains is that in the middle of sprint, hurdle, jump, or kick the athlete will feel a tightness or pulling type pain in his posterior thigh that will cause him to stop physical activity. Do not let this become a chronic issue! The scary thing about hamstring strains is that the rate of re-injuring the muscle is very high, meaning that it can easily transition to a chronic problem if not correctly addressed. Across the board, the absolute biggest risk factor for having a hamstring strain is…. a previous hamstring strain. In fact, a study done on 500 amateur soccer players showed that a previous hamstring strain has been shown to increase the risk of a recurrence up to six times as much. The logical question is why does this happen? Since the symptoms of a grade I and grade II hamstring can be uncomfortable /annoying but tolerable during activities of daily living, the athlete often prematurely returns to activity after rest. This may lead to repeatedly unsuccessful efforts to return to sports without letting the muscle heal adequately. Thus, the muscle is not strong enough to tolerate the usual demands of sport which leads to another strain, or worse, a complete tear. Risk factors shown to correlate with an initial hamstring strain are decreased hamstring flexibility, poor muscular strength/ endurance, poor core stability, lack of proper warm-up, inability to disassociate the trunk from the lower extremities, and poor lumbar posture. Our board-certified Doctors of Physical Therapy at Fox Physical Therapy will be able to identify any of these aforementioned deficits during the biomechanical evaluation. From there a plan of care will be implemented to correct the impairments quickly and efficiently. Remember the biggest risk to recurring hamstring strains is having that first hamstring strain, so even if you are not injured we can help to identify possible risk factors ensuring you stay at peak performance levels. Don’t wait until you break down to seek treatment. That’s the equivalent of letting your car break down on the side of the road before finally getting an oil change. In the event that you do sustain a hamstring strain, physical therapy becomes of the utmost importance to guide and progress the athlete through his/her rehabilitation and prevent an acute injury from becoming chronic. Current literature supports that clinical diagnosis of a grade I/II strain by an experienced physical therapist is as reliable and valid as ultrasound and MRI, meaning that one does not necessarily have to wait to go to a doctor and then wait again to get an MRI in order to begin the rehabilitation process. In Florida, anybody can directly access their Physical Therapist without the need for referral. Fox Physical Therapy, Miami’s premier orthopedic and sports physical therapy center, is proud to announce that we are expanding north with the opening of our newest clinic in Boca Raton Florida on May 1. Conveniently located in the Twin Lakes Professional Center at 2900 North Military Trail, Suite 220, the new Boca Raton location will offer patients a hands-on, results-based approach to addressing a wide range of work, auto, orthopedic, and sports related injuries or post-surgery therapy. Fox Physical Therapy opened its flagship Miami facility in 2014. Along with an experienced team of therapists, he has grown it into one of the top physical therapy centers in South Florida. Fox Physical Therapy received the 2015 Patients’ Choice Award as one of the Top Physical Therapists in Miami. Fox Physical Therapy Boca Raton will accept all major insurance carriers and offers those without insurance a self-pay rate. To book an appointment, please call 561-923-8292.